Most Eastern arts seek ways for the practitioner to spend more time in a deeply relaxed state, that is, with a meditative mind. This deep level of meditation is an essential step for achievement in all Eastern disciplines. Most Eastern arts seek ways for the practitioner to spend more time in a deeply relaxed state, that is, with a meditative mind. This deep level of meditation is an essential step for achievement in all Eastern disciplines: seeking enlightenment (meditation), better performance (Kung Fu), higher quality of life (Taoism), and better health (Qigong). Through centuries of accumulated experience, the Eastern arts discovered that the mind is usually in an active state, even during sleep. This has been scientifically researched and verified in modern times. A common realization is that in order to achieve a deep level of relaxation and high skill in internal arts, one needs to develop a concentrated and meditative mind, which can be difficult to reach for any person. In fact, achieving this skill is an art in itself, which has been explored by many disciplines, if not all, such as Buddhism, Zen, Yoga, martial arts, dance, and various sports. Individuals have discovered that by isolating themselves, such as in a monastery or cave, while limiting the food intake and external stimulus, one may create a better environment for the mind and the spirit to remain for longer periods of time in this meditative state. One enters this state when the brainwave activity slows from the usual beta and alpha brainwaves of daily activity to the borderline near-sleep state between theta and delta brainwaves, which have greater amplitude and slower frequency. Staying aware, and keeping the mind centered and focused in this state is not only difficult, but rare. It is hard to find opportunities in our normal daily routines to spend time in this state, except during the few seconds right before we fall asleep. The untrained mind tends to stray toward activity and daydreaming, or deeper into the delta sleep state. Do not be discouraged, though, through knowledge and practice, this skill can be acquired. Internal arts masters were aware of this problem for the beginning student. They developed postures and methods, tricks and secrets, to stay longer in the desired brainwave state. Sitting and chanting during meditation, standing and using visualizations such as in Yoga and Qigong, or moving slowly with a martial intention as in Tai Chi, are meant to help the student develop this ability or skill. The reason that physical posture, mental technique, or even the sound of a bell is used is that through training with these methods, the student can practice attaining this state. Reaching this deep level of relaxation with a meditative mind sets up the correct environment for higher success in the martial arts, and is one of the key secrets of awakening the self-healing mechanisms within ourselves. When teaching my students the movements, philosophy, and concepts of the various Eastern arts, and working with them on what I call “body prescriptions” for healing or for martial arts, I often ask questions to sense their level of understanding. After years of teaching, I realized that my students usually gave me partial answers, addressing an issue either on a physical level or only the mental, but very rarely a complete answer. Therefore, I now ask them to give me a complete answer, or to answer by first acknowledging that the response is based on the physical or mental aspect. The reason why I am telling this story is to emphasize the importance of understanding both sides—the Yang physical body, and the Yin mental, or energetic, body. Both bodies are one and cannot be separated, but at some times they can be trained separately for better results. Here is an example of a question that I hear from many students: What is happening when we are performing the Full and Empty Moon breathing? A good answer would be: On a physical level, we are moving the abdominal muscles and back muscles in and out as far as we can in a relaxed manner, coordinated with the movement of the perineum. 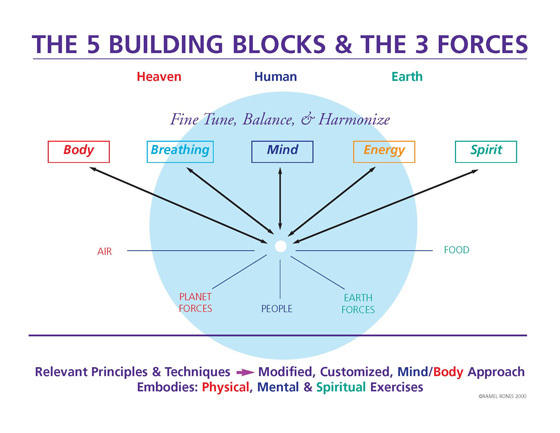 Mentally, have a strong sensation of residing in the Center of Gravity Energy Center, and experience the three forces: Earth, Human, and Heaven. Here we will take the time to explain the various internal visualization skills you will be utilizing during the preparation exercises and your Tai Chi practice. These visualizations are tools we will use, and they are a fundamental aspect of your training which need be explored deeply before you move on to the Tai Chi form. If you do not feel comfortable with more than two visualizations at the same time, your mind is not ready, and you have advanced through each stage of your training too quickly. The length of training of each stage is different for each individual. Take your time and enjoy each stage of developing these internal visualizations. Some days are better than others. Do not be too hard on yourself. Take each day of your training in stride. One day, you will find that your awareness of yourself, your surroundings, and the meaningfulness of your life have expanded greatly. The first step that will help you to begin to become aware of both your physical and mental body is to sit cross-legged or on an edge of a chair with proper alignment and experience the various basic energy centers, channels, and vessels that run through our bodies and distribute energy (Qi). Sitting this way allows you to focus on experiencing your torso. Once you are able to sense the movement of this Qi energy your sensations will become stronger, and you should move on to more advanced stages of internal visualizations with standing and moving postures, which include other energy concepts and work with channels in the limbs and the forces surrounding us. Establish a good sitting foundation. The legs should be crossed comfortably if possible, or if the student is able to sit in a more advanced posture, you may sit in lotus position, with the right foot on the left thigh, and the left foot on the right thigh. You may also sit in half-lotus as your legs develop flexibility. Sit up straight on the edge of a cushion so gravity does not pull on your lower back and distract your mind. Though it can be difficult to re-train the muscles to sit up very straight and aligned, balancing the spine upon itself, slouching even slightly will cause a sore back very quickly. The edge of the knees should rest completely on the floor, to create a strong, triangular base, between the sitting bones in the rear and the outside of the knees. This posture will diminish the flow of energy in the legs, so you may begin to experience the energy in the torso, circulating in what is called the Microcosmic Orbit, or Small Circulation. Your energy naturally circulates down the front of your body from your navel, underneath, between the legs, and then up the center of the back and neck, over the top of the head, down the center of the face, and then down the front of the body to the navel again. Your tongue should touch the roof of your mouth, right behind the front teeth, to complete this circuit. Follow the breath with your mind to calm the thoughts and reach a basic level of physical relaxation and awareness. Your complete attention should be continuously held on the breath as it moves in and out. This is the first requirement for training, as taught in Zen meditation, which is known as Chan in Chinese. When you inhale, feel your abdomen expanding to draw a breath, the breath entering the nose, moving the nose hairs, then moving to the back of the throat, to the bronchial tubes, and then filling the different sections of the lungs. Pay special attention to the feelings and sensations of the interactions between the air moving in and out and the body cells it is touching. Put your mind into each part of your body experiencing these sensations. Experience the end of inhalation and then linger for a moment before exhaling. This is considered the quietest time in our body. By training this skill of putting your mind into your body, you will develop a stronger and more sensitive mind/body connection, which will enable you to be aware of your health, and other aspects of your life, on a much more sensitive level. When you focus awareness (or Wisdom Mind, Yi in Chinese) entirely on the breath, you will help to create a state of No Thoughts. When random thoughts arise, simply observe them, with a neutral emotional state, and then turn your attention back to observing the breath. The Chinese call this state The Horse Mind Seizing the Monkey Mind. The breath should be long, quiet, peaceful, slender, continuous, and soft. Inhalation and exhalation should be balanced and equal in length, unless the student is in the more advanced stages of training in which we use the breath differently to change Kan (Water) and Li (Fire) in the body. The goal is to use only the minimum physical muscular force to hold and lengthen the spine in comfortable physical alignment. Let go of unnecessary tension in the entire body. One by one, relax your face, your shoulders, your arms, your torso, your belly, your hips, your legs, and your feet. Become aware of the up and down forces in the body during sitting meditation; the bones and muscles lifting and holding you up, while the shoulders and the soft tissue, including the face, are “melting” down as gravity pulls down on you. My teaching of this has been influenced by the teachings of students of Martha Graham and by the work described in various books, one of which is Anatomy in Movement by Blandine C. Germaine.